Hi there! My name is Marie, and I’ve been writing for Angel Messenger for a little over two years, and I currently live in Italy with my husband. When Rev. Sheri approached me about taking part in the Mother Earth Project, I didn’t give it a moment’s thought. I said yes immediately. 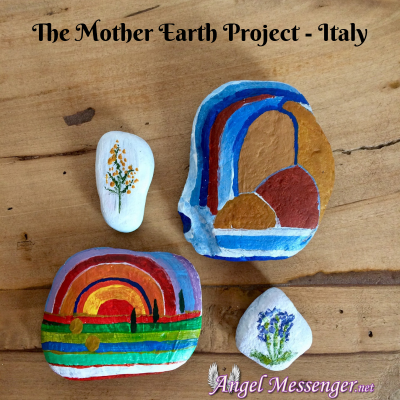 The Mother Earth (Beacon of Love) Project is a campaign to spread love, hope and positive energy by painting stones with inspirational images or words. Then, you sign the back of the stones with “Love, M.E.”, or “Love, Mother Earth” before leaving them around town for people to find. Although this might sound like a selfish motive, I really wanted to do this project to increase my sense of connection in Italy. Since moving here, I have struggled to feel at home in our little town. We live in a mountainous area in Tuscany, and while no one can deny its natural beauty, it can feel quite isolating – especially for a foreigner. Perhaps Mother Nature knows this though because running through our town is the Arno River. It is here that I feel connected, at peace and at home. There is a long path that traces the winding river, and my husband and I spend a couple of hours each day walking this path. It’s a busy trail, and many locals take their daily walks or bike rides along the river, too. When I started the project, I decided to source my stones from this river walk. To be honest, I like to think that I borrowed the stones and then gave them back to her. Even before I started this project, I already began to feel more connected, both to Mother Earth and to this specific town where she is holding me. Ralph Waldo Emerson is attributed with saying, “The earth laughs in flowers,” and I have always admired flowers for their stubborn positivity and cheerful attitudes. 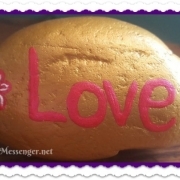 So, I thought flowers would be perfect Beacons of Love to paint on my river stones. Here, in Tuscany, the Mimosa trees are bursting with puffy little yellow flowers. So, I painted joyful Mimosa onto one of my stones. Another favorite flower, who is slowly coming out of her shell, is Lavender. I painted sprigs of quiet lavender on my second stone. With these two flower choices, I’m reminded that Mother Earth loves us in so many ways. She energizes us, but she also grounds us. Yes, the earth laughs in flowers, but sometimes she offers soothing support with them, too. My husband doesn’t consider himself a painter, but if you ask me, he’s not too shabby with a paint brush. Me on the other hand? Let’s just say I’m no Michelangelo. When I told him about the Mother Earth (Beacon of Love) project, he really wanted to join in, and I’m glad we did this project together. The first reason why it was wonderful having him on board is that he’s very supportive. 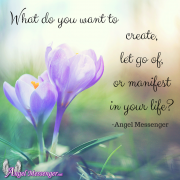 There were many times when I felt discouraged and dismayed at how unsightly my stones looked. I repainted them many times, but he was always confident that I could create something I felt happy with. He provided the support I didn’t know I needed. While I could have compared my dismal painting skills with his talent, I decided to just enjoy the contrast between us. After all, our individual offerings are not always picture-perfect, but they don’t have to be valid. And our imperfections shouldn’t hold us back from spreading love, joy, and positivity. Unfortunately, this is often just what happens. Perfection and the fear of not being good enough hold many of us back from loving ourselves, and therefore, from extending love beyond ourselves. Think back to the flowers. The roses don’t say to themselves, “I’m not going to bloom today, because I’m not as beautiful as an orchid.” Every flower just blooms because that’s what it’s supposed to do. And we can offer love even if it doesn’t look like an edited Instagram post. 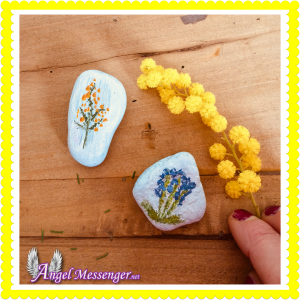 The other reason why I loved having my husband join the Mother Earth (Beacon of Love) Project is that he created such joyful and uplifting images on his stones. I’m sure Mother Earth is proud of how he illustrated her beauty. Based on the natural texture of his first stone, I suggested he paint a waterfall, evocative of the Arno River. I love what he came up with, and I believe anyone who finds his stone will love it, too. His second stone is bursting with rays of sunshine and rolling hills. I know this simple message of love will find the perfect home. Taking part in the Mother Earth (Beacon of Love) Project is such a wonderful experience on so many levels. 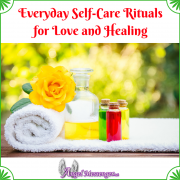 For one thing, it can increase your connection to the earth and to others. I know this is true for me. This project also allows you to slow down and take up space in the energy of Mother Earth – it feels good. 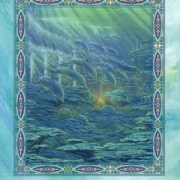 Finally, by spreading the love, you yourself become a beacon of love, helping to elevate the energy of our planet with these humble, yet powerful, messages of love. Learn More about how you can join the Mother Earth Project by clicking here! Wow, I really love this article. I was just feeling just like this article was saying, not enough. I love every word you said and felt like I was completely on this journey with you. Much love to you and yours.